Hello everyone! Just wanted to pop in with a quick card I made yesterday for a few blog challenges. First is the CAS On Sunday Challenge Blog. I was so happy to be one of their top picks last week for Challenge #106 and had to play along again for this week's Challenge #107, which is is to use glitter or sequins on a card. 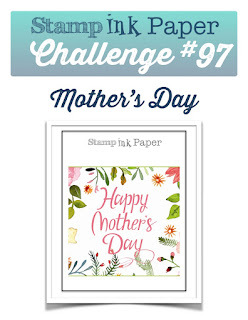 I'm also adding it to this week's challenge over on the Stamp Ink Paper Challenge Blog, which is Challenge #97 - Mother's Day. 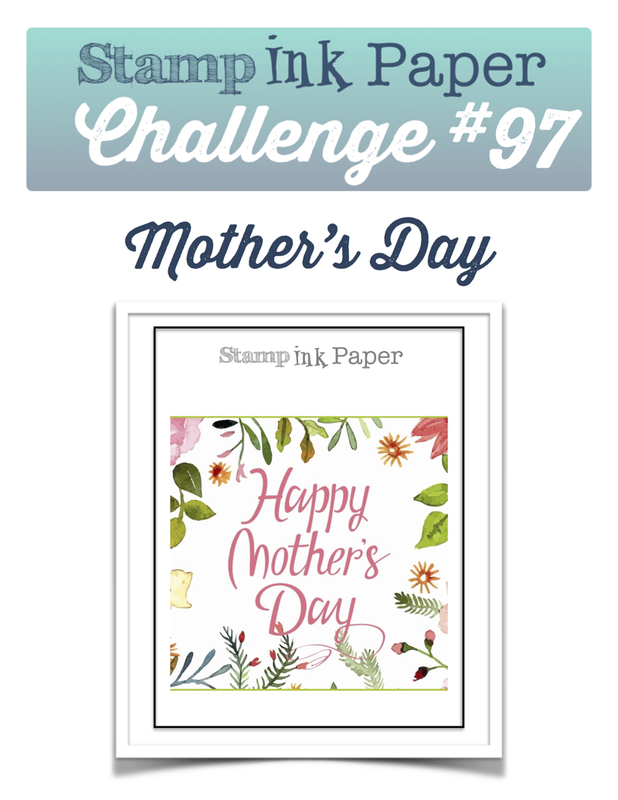 And this week's challenge on the Cards In Envy Challenge Blog, which is a Motherly Love Card Challenge. Now...my first thought when I saw the words glitter and sequins was to make a shaker card. But I figured that would everyone's first thought and I decided to go in a different direction. I decided to use glitter as an element in the image. I started by making a top folding A2 card base out of white cardstock to which I adhered a piece of decorative cardstock. I cut another piece of white cardstock using the stitched rectangle from Bundle of Stitched Shapes (Simon Says Stamp). I stamped the flower image from Everything Joyful & Beautiful (Unity Stamp Co.) using Memento Tuxedo Black ink and then I colored it in using Copic markers (Y08, FRY1, FRV1, RV11, and G05). Next step was to add some glitter. I started with the top yellow/orange flower by applying dots of glue to the black dots around the flower with my Zig 2 Way fine tip glue. I then poured some Sunflower colored glitter (Recollections) over the glue. I waited a minute and then removed the excess. I then went and did the same to the pink flower using Bubblegum colored glitter (Recollections). When it was dry, I adhered this to the card front. I also adhered some pink sequins and the phrase "Happy Mother's Day". Done! Labels: #stampinkpaperchallenge, Card, Cards In Envy, CAS on Sunday, Mother's Day Card, Simon Says Stamp, Stamp Ink Paper, Unity Stamp Co.
First, my CAS Wedding Card from last week, where I used that beautiful image from Gina K Designs, was chosen as a winner for the Stamp Ink Paper Challenge #96. Second, my "You Hog My Heart" Card from last week, where I used the dies and stamps from MFT Stamps, was a winner on the CAS on Sunday Challenge Blog!! And, third, I woke up to find out that I was a random winner in a contest on the Stamp Junkies Facebook Group! Cannot wait to see what I get. A big YAY to me and a big hug to all of you guys for keeping me creative on this blog! 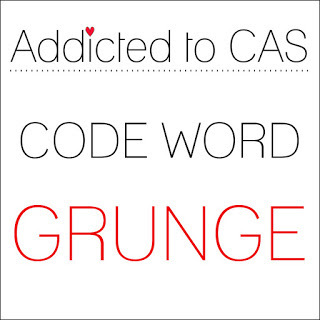 Today I have a super easy CAS birthday card to share with you guys. I made it for the Addicted to CAS Challenge Blog. This week's Challenge #110 is GRUNGE!! When I saw "Grunge" I immediately thought of a stamp set I have called Distressed Patterns by MFT Stamps. I wanted the colors to pop so I grabbed my Kiss, Ice, Sky, and Fresh Color Pop Inks by Susan Weckesser and ColorBox. I stamped different "grunge" images across the front of a piece of white cardstock that I had cut with the stitched rectangle from the Bundle of Stitched Shapes by Simon Says Stamp. I love these vibrant colors!! I cut a top folding A2 card from white cardstock and I adhered this to the front of the card. Then I cut the word "happy" from the Happy Die (MFT Stamps/retired) out of black metallic cardstock and I stamped the word "birthday" from the Label Maker Sentiments (MFT Stamps) using black onyx versafine ink. 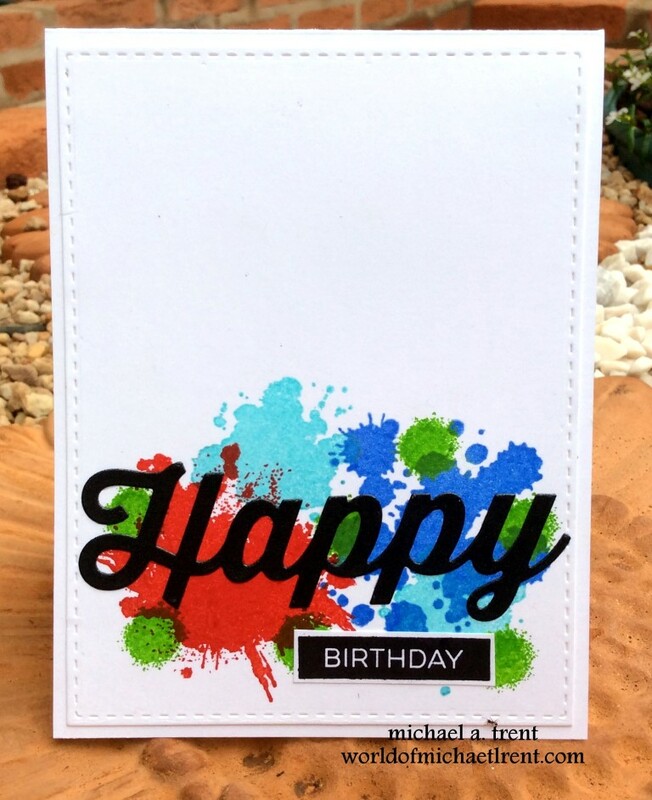 I adhered both to the card front so they sat on top of the colors. I was thinking of adding some sequins but keeping the card this way allows it to be given to a guy or a girl. Right? Done!! Told you...simple and clean...or is that clean and simple? LOL I'm really happy with this card and love how those inks pop off the paper. I made two more cards like this but not as CAS. Will post those during the week.